The Edinburgh Postpartum Depression Scale? "What is The Edinburgh Postpartum Depression Scale?" The Edinburgh Postpartum Depression Scale is a list of 10 questions that is completed in minutes by mothers and then scored by doctors. It has been extremely accurate in several cultures and countries for detecting postpartum depression even within seven days of delivering the baby. 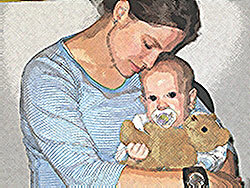 At least 10% of moms will suffer from postpartum depression. If it is detected early, doctors can effectively begin treatment. Your postpartum doctor check up may include completing the Edinburgh Postpartum Depression Scale. Click here to view and answer the questions. Click here for more info on the Edinburgh Depression Scale at the McGill site. Then talk to your doctor about the results of your questionnaire. Remember that Postpartum Depression is treatable thanks to practical skills you can learn immediately! Go NOW to read our life changing e-course on beating depression based on proven research from the medical journals.